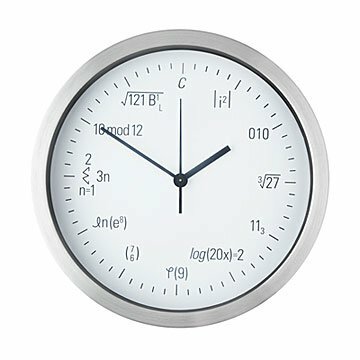 Add a mathematical twist to the everyday with this equation wall clock. 1: i is equal to the square root of -1, so i^2= -1. The absolute value of -1 is 1. 2: This represents 2 in binary code. 5: Log(20x)=2 is equivalent to 20x=10^2 or 20x=100, where x=5. 7: This is a binomial coefficient, so with the formula n/k = (n!)/((k!)(n-k)! ), n/k=7. 8: This is a natural logarithm where ln(e^x)=x, so ln(e^8)=8. 9: This summation is equal to 3(1)+3(2)=3+6=9. 10: Since clocks "wrap around" every 12 hours, the hour number starts over after it reaches 12. This is arithmetic modulo 12. 10mod12 is 10:00, and 16mod12 would be 4:00, for example. 11: B'L is Legendre's constant, which is equal to 1, so this equation becomes the square root of 121, which is 11. Clock movement, aluminum bezel, and glass cover made in China. Clock dial and hands made in USA. Assembled in Los Angeles, CA. For more geeky timepieces, check out the Equation Geek Watch . Dust with dry, clean cloth. Requires one AA battery, included. Replace batteries when used to prevent corrosion in battery compartment. It was gifted to my daughter for her bedroom. She loves STEM related things so it was perfect. It also gives everyone a good laugh and it's fun to watch people try to figure out the equations. Even though I don't understand all of the equations I can still tell what time it is. The Math equation for 9:00 on the enclosed instruction sheet is incorrect. The number at the top of the summation sign should be 2, not - 2. For 6:00, on the click, the letter should be a lower-case Greek symbol phi. Ad printed, it does not look like a lower-case phi. Lots of versions of this concept, but this is the best one. Equations on it are sufficiently obscure to remain a challenge, and the typeface is clear. He is a difficult person to buy for. Never asks for anything (since he was 6!). But this was right up his ally since math and physics go hand in hand! He hung it on his bedroom wall as soon as he got home. My son is a math whiz and he got a kick out of this clock. Most attractive clock design of any similar items I've found! My brother really loved it and enjoyed proving how he knew each equation correlated to each number hour.